The rails that run down the middle of the street belong to the Interurban which took passengers to and from Indianapolis several times a day. The very large building on the right is the Crawford Hotel which was torn down in the 1970’s. 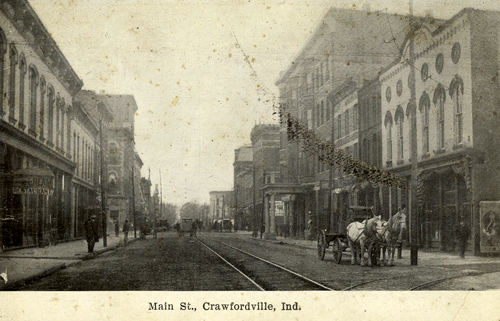 The Crawford was a luxury hotel where most of the guests of the College stayed while in town. It was also the site of many alumni banquets. That space is now a small park with a fountain. When this picture was taken, the fraternities still had rooms in the upper floors of the downtown buildings and had yet to become residential. The downtown halls were primarily a social venue and the scene of many regular dances. The building on the left near the camera is still of very great interest to our students today as that is the home of Little Mexico. A regular venue for faculty, staff and students, stop in any evening and you are likely to see several members of the Wabash family. This image is a portion of the centerfold from the 1962 yearbook. I zoomed in and then cropped the image to show the many changes to this portion of the campus. In this image: The Library is still new and does not have the expanded footprint we know today. The MXI has yet to be founded and the mall has not yet achieved its current configuration. Yandes (now Detchon) is still facing the Arboretum and about half the size of today’s building. The Betas have commenced construction of their “new” house. The Delts are still across the street in their old house. Hovey Cottage and Forest Hall have yet to arrive at their current location, near the Caleb Mills House. I love to look at pictures like this of campus over time. A great deal has changed since 1962. A great deal is also the same. Students still rush to class straight out of bed. The Library, now approaching its 50th anniversary, is still a central hub of the campus. The Campus Center, now Sparks Center, is still the scene of faculty roundtables at the Scarlet Inn. Students still grouse about the food served in the Great Hall and study like crazy. It seems that there is a thread that runs through this place that is pure Wabash and never changes. 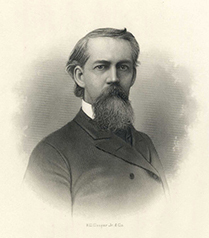 Byron Trippet used to refer to the life of the college as a tapestry. That is just about the best way to describe this place of many parts, constantly changing and yet still the same. A beautifully woven, yet never finished, tapestry. Lincoln was close to two Wabash men — John Charles Black ’62 and William Perkins Black ’64 — who quit the College at the start of the war to join the army. Lincoln was friends with their stepfather, Dr. William Fithian, whom Lincoln had represented in legal matters. While riding the legal circuit, Lincoln often stayed at Dr. Fithian’s home in Danville, Illinois, about 40 miles west of Wabash College. William Perkins Black [W1864] taken in later life. Fortunately the brothers, cared for by their stepfather, survived their wounds. John and William were each awarded the Medal of Honor, becoming the first of only five pairs of brothers in our nation’s history to have earned the honor. After the war, John served as U.S. Attorney in Chicago, was elected to Congress and chaired the U.S. Civil Service Commission. His brother William, who also became a lawyer, defended the Haymarket martyrs at their trial. ……………………………………………………………. Isn’t that a great story? A little research here in the Archives shows that the Blacks were original members of the College Cadets. Like so many of their fellow students, on the day that Ft. Sumter was attacked, both brothers joined Lew Wallace’s company. The Blacks were 90 day men who served their terms then returned to Danville and recruited Company “K” of the 37th Illinois Infantry. It was at the head of this Illinois company that the brothers were wounded. John ended the war as a Brevet Brigadier General and lived a long and productive life. Both brothers maintained very close connections with Wabash throughout their lives. John’s grandson, John Black Vrooman, even attended Wabash, graduating in 1921. While both men rose to great heights professionally, I still tend to think of them as one of the group of earnest young men pictured out in the Arboretum practicing their drill routines and perfecting their form, while all around them the war clouds are gathering. 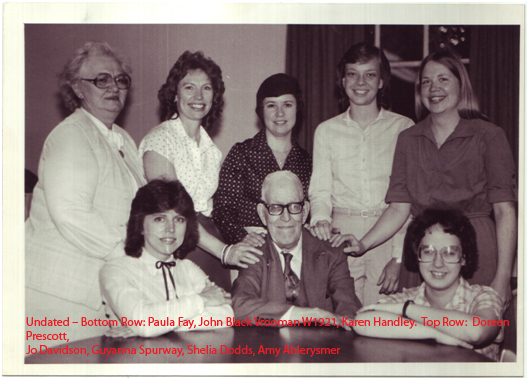 Here is a photo of Vrooman and his lady friends…He wrote them often and signed his name as “Uncle John”. John Black Vrooman on a return to campus. With 2009 as the Bicentennial of Abraham Lincoln, it seems that everywhere we turn there is another Lincoln event! 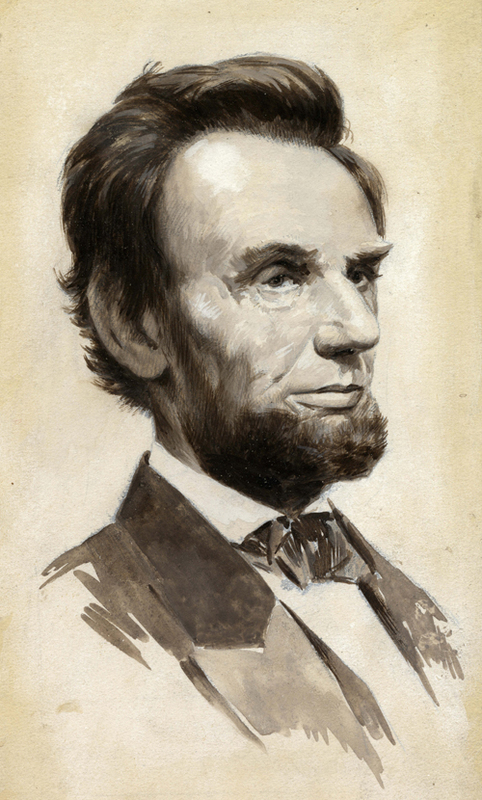 Not to let a chance to highlight our collection slip by, we are hosting an exhibit entitled, “Lincoln in the Library”. This display features some items from collections in the Lilly Library and in the Special Collections of the Archives. Among the great things that we have are this illustration by Walter Goater. It says on the back that Goater knew Lincoln. A little research shows that Goater was an illustrator of that era and was from Illinois. His work appeared in Frank Leslie’s Illustrated Newspaper, a popular periodical. Several of his sketches were printed in the Volunteer Soldier of America a book by General John A. Logan. The image is so stunning that we have used it for all of our posters. We also have a book by Ward Lamon, Lincoln’s good friend and bodyguard which offers rich detail on Lincoln’s life and work. We have a report from the Pinkertons about Lincoln’s trip to Washington and the threats to the President’s life. Pinkerton, best known for his famous detective agency, during the war worked for the government as a special “secret service”. His work was to catch counterfeiters and protect the president. Just what our modern Secret Service does today. A book by Elizabeth Keckley is a real treasure and one of my favorites. Keckley was a black seamstress with a substantial D.C. clientele. She had worked very closely with Mrs. Jefferson Davis before that lady left to become the First Lady of the Confederacy. Keckley created Mary Todd Lincoln’s inaugural gown and, based on that excellent work, became Mrs. Lincoln’s friend, constant companion and dressmaker. This memoir was written shortly after the Civil War and intended as a defense of Mrs. Lincoln who was under intense, and mostly negative, scrutiny at that time. The book was reviled and it is said that Robert Todd Lincoln had it pulled and all available copies destroyed. Another book of interest is a facsimile of “Lincoln’s Own Book”. It is a very small memo type of book into which Lincoln himself pasted copies of all of his speeches. It was for the use of a friend who was working on his campaign so that he might get Lincoln’s very carefully chosen words just right. We also have booklets that were created for the presidential campaigns of 1860 and 1864. Most of what is on display comes from the Howell Collection of Lincolniana. This display is the culmination of several weeks of work here in the Archives. Ginny Maharry and I have really had quite an immersion experience and never even left home! 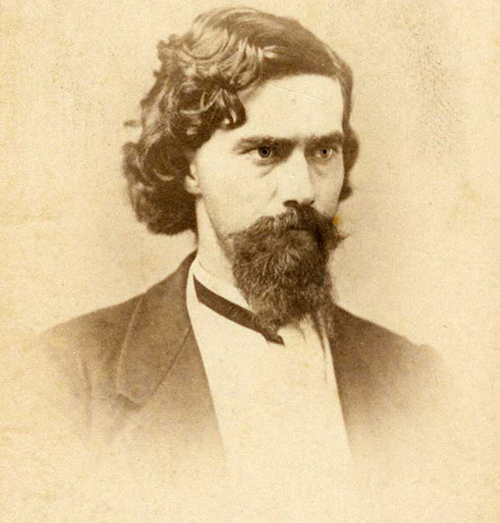 John J. Blinn was a Terre Haute boy of 16 when he arrived at Wabash to attend the Preparatory School in 1856. Student life at that time was fairly straightforward and consisted of lectures, recitations and studies. The spice was added by the two Literary Societies which held frequent intramural debates, John was a Lyceum man. There were, at that time, no organized athletics at Wabash. A pastime gaining in popularity across the country was the pursuit of the perfect drill team. Not far in time from the Mexican War, America was still in a military mindset and veterans were often prominent citizens. Locally, Lew Wallace was well known and had served in the Mexican War. Wallace put together a group known as the Montgomery Guards. Blinn learned the maneuvers from Wallace and formed the College Cadets. John Blinn was a sharp, smart fellow and well liked by both his professors and his fellow students. He was a leader on campus and was elected the Captain of the new Cadets. This student group was evidently quite focused on their drills and Blinn was a good captain. The Cadets performed well wherever they marched and all who knew him liked him. John was in many battles, including Antietam where in September of 1862 there were 23,000 soldiers listed as killed, missing or wounded in one day’s battle. He wrote a letter to his sister the night before this fateful encounter, “On the eve of a great battle I have sat down upon the ground, and with my saddle for a table to write a few words to the loved ones at home….” Blinn was wounded in the face and, as he wrote to his sister after the battle, was “sickened at heart” by his unit’s losses. 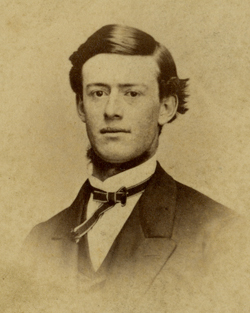 He secured a medical discharge in October and returned to Wabash for the start of the Winter Term in January of 1863. “My dear Mother Brother & Sisters – Your soldier boy is wounded. But we whipped the enemy & the old flag is again victorious, glorious. My wound is a very serious one & I fear amputation may be necessary. I may die but – Mother! God give you strength & grace to bear the affliction. My country called, I came to die upon her altar. God bless you & keep you. I can write no more. His mother left immediately for Gettysburg, but found it rough going as so many railroads and bridges had been destroyed by the Confederate troops. She arrived on July 10th and stayed with her son in his hospital tent until he died on the 13th. He was greatly mourned on campus and also in his hometown where the Terre Haute Daily Express offered these words, “Thou art gone from our midst gallant Blinn & the world seems drearier than before.” He was 22 years old.